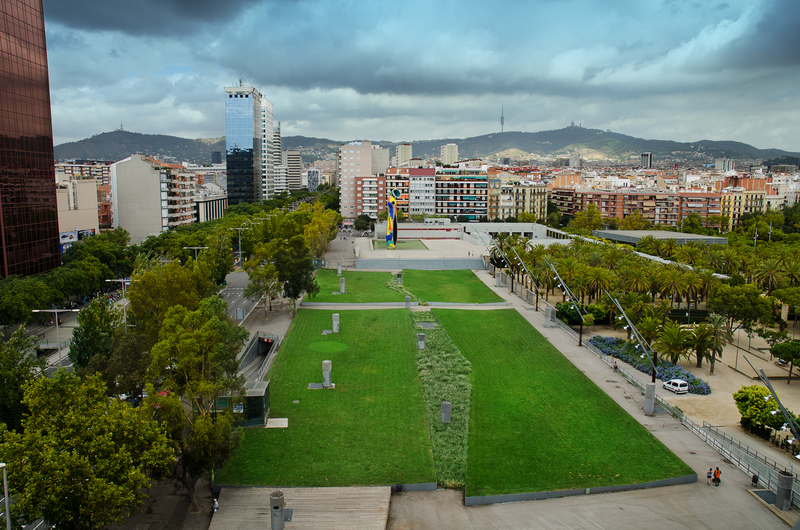 Here is a view of Parc de l'Escorxador or Parc de Joan Miro with the famous Dona i Ocell (1982) by the famous Catalan sculptor (Joan Miro Barcelona, 1893 - Palma, 1983). This shot was taken from the roof of Las Arenas shopping center. The colors are enhanced because I thought the whole scene was rather dull. In fact it still is but maybe with a little luck you happen to focus on the beautiful sculpture in the middle and follow the link to my previous post and better appreciate the work of Joan Miro. que verde se ve todo por allí... esta foto es de enero? bueno claro que hay palmeras y cosas así que deben estar verdes todo el año... es que es una tristura pasear por madrid con todas esas ramas desnudas... un saludo! I'm afraid I don't know this park. But have enjoyed the Miro Institute on Montjuic.